A single decision has the power to unravel mankind. The world’s first woman, without flaw, until one fateful choice. Now all humanity must pay for the mistake. From paradise to exile, from immortality to the death of Adam, experience the dawn of mankind through the eyes of Eve — the woman first known as Havah. I have had Tosca’s book on my TBR shelf since 2009, and I meant to read it soon after I finished reading her other novel, Demon: A Memoir. Somehow, this book got pushed farther and farther down Mt. TBR until I almost forgot about having it. It wasn’t until I was thinking of a good book to start 2011 with that I remembered having this one, so I dug it up from my books, and cracked the book open again come 1st of January. Around October last year, some of my Goodreads friends started a year-long reading challenge to read the Bible in its entirety. I have tried reading the Bible from cover to cover back in college but I failed miserably when I got to Chronicles. When I heard of the challenge in the group, the challenge addict in me jumped in, choosing to read The Message translation of the Bible for easier reading. The thing with reading the Bible is it’s so easy to be disenchanted with the stories there, especially if you’ve heard the stories in it over and over, particularly in Genesis. What else there is to read about Adam and Eve anyway? They were created, they lived in God’s presence, then Eve got tempted and got Adam in with her. They were banished from the garden, they had kids, and then the world started with them. Not that interesting, right? They say familiarity breeds contempt, and I guess that has happened to me in the case of Genesis. Tosca Lee breathes life into the story of creation, particularly with the first woman ever created in Havah. I have seen paradise and ruin. I have known bliss and terror. I have walked with God. And I know that God made the hart the most fragile and resilient of organs, that a lifetime of joy and pain might be encased in one moral chamber. So it starts. I fell in love with Tosca Lee’s writing with Demon, and I knew Havah is going to be just as beautifully written as the former, if not more. 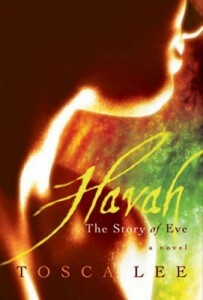 This retelling of Eve from the moment of her creation to their fall to their exile and her mortal life was told in Eve’s point of view, making the novel feel more personal compared to Demon. I am not an expert in theology so I can’t say how accurate this was or if Tosca missed addressing something in this novel. However, I can say that reading Havah became more than just leisurely reading but almost a personal journey. Eve, christened as Havah by the adam because she “…will live, and all who live will come from [her], and [she] will give birth to hope.” (p. 102), spoke to my heart as she told her story. I guess it’s because she’s a woman, and I sympathized with her struggles and her woes. How I could I not? In a sense, I was also Havah — I sinned against God so many times that I know I am so far away from Him, but I crave for His presence just as Havah sought Him, too. It was that brokenness that got to me the most. I do not blame her for her act of disobedience and in the fall, because as she said quite eloquently, “If not for our transgression, we would not know redemption.” (p. 349) In a sense, Havah really embodied how it is to be a human in this broken world: a constant struggle to find God in our surroundings, in the people and in life, pressing on even if sometimes He seems empty and silent. Since this was told in her point of view, this will seem like a female-biased novel, but I think (and hope!) that guys will still be able to find themselves in this novel, too. It’s hard to describe this novel in its entirety because there is so much beauty and pain and love in this book. You can also watch Tosca talk about Havah in this video.